Public administration graduate student Tyler Bennett performs an original acoustic piece, mixing flamenco with his own original riffs Tuesday in the Jane Dibbell Cabaret Theatre. 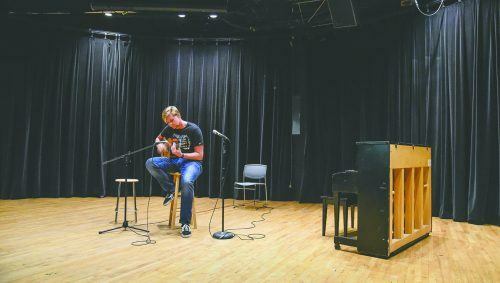 Student Cabaret Productions hosted an open mic night to provide an opportunity for students to perform in front of an encouraging audience without judgement. All eyes were on Milo Charpentier as he hit the stage with his ukulele at the Jane Dibbell Cabaret Theatre Tuesday. Charpentier was the first among many students who took the opportunity to showcase their special talents at the open mic night event hosted by Cabaret Student Productions. Charpentier is an actor who decided to take on a new artistic challenge: singing. He performed “Party Favor,” by Billy Eilish. The theater was set to be filled with students ready to experience performances that ranged from singers to poets and comedians. Miranda Tejeda, freshman theater major, said that this is the first event she has ever produced. “It’s open for the whole community and anyone who just wants to come in and perform their talents,” Tejeda said. Some of the artists used comedy as an outlet to warm up the crowd up and guise their fear. One student went up and sang after saying they had not sang in two years. They said the love for their craft had never left, regardless of how many years it has been since they had practiced. Josh Soleta, junior history and music major, hit the stage with a guitar in hand and sat on the stool center stage. Soleta said he was a former La Verne student and was happy to be there to perform. He told the crowd that he no longer attended the school because he was too poor. Soleta finished his performance with a song on piano. The night continued with freshman political science major, Jonas Poggi who performed “Mr. Brightside” by The Killers. Poggi said it had been a long time since he’s performed in front of people, but he was glad to be on the stage. Events are held in the Cabaret Theatre every other Tuesday.